Luxury is the definition of the Grand Tour. 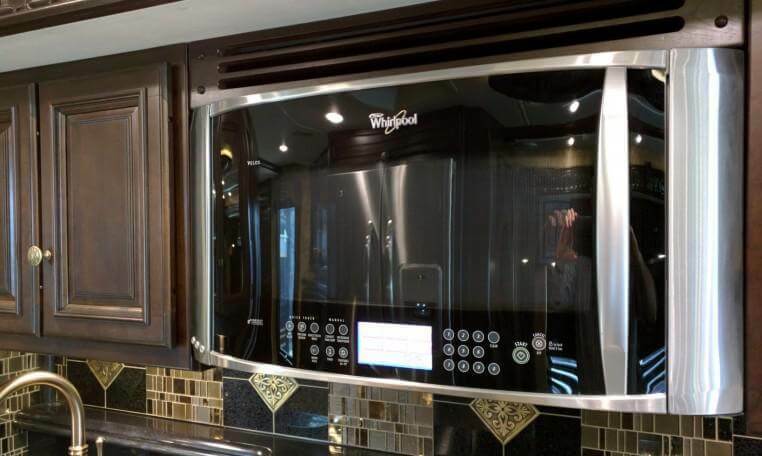 Winnebago has designed their Class A Diesel motorhome with refined elegance including upscale amenities throughout this unique model. 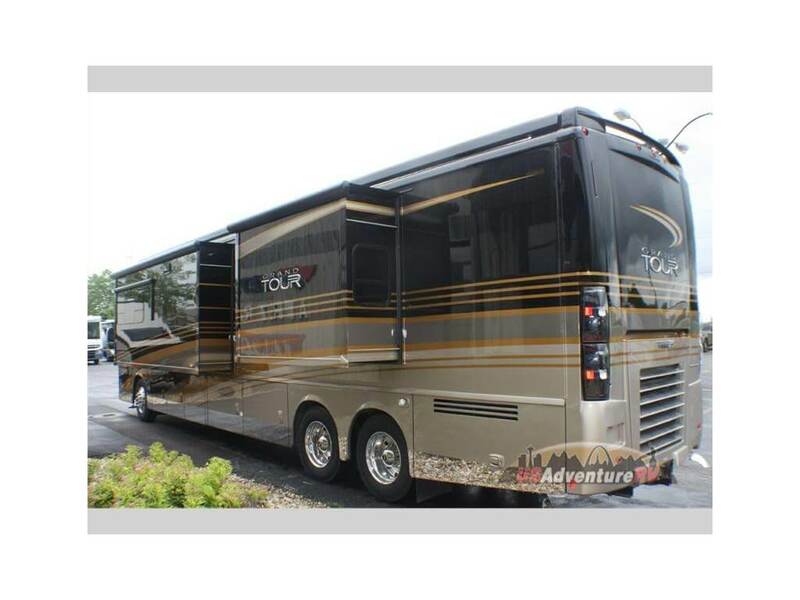 This motorhome is not for the every man (or woman). 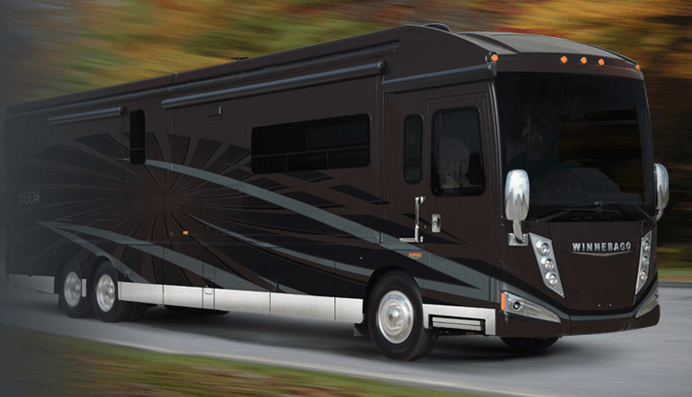 It is intended for the discerning RV’er (or full timer) who’s looking for a travel experience that includes luxury, spaciousness, and convenience. This is not your pup-tent happy-on-the-ground camper/traveler. This is a classy ride for discriminating travelers. 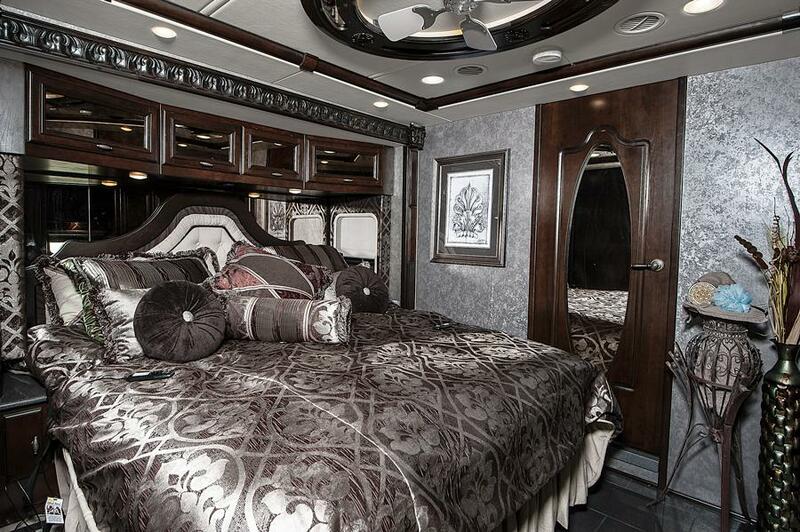 Choose from 3 interior collection packages to design your coach to your discriminating tastes. High class elegance to classy and sleek. 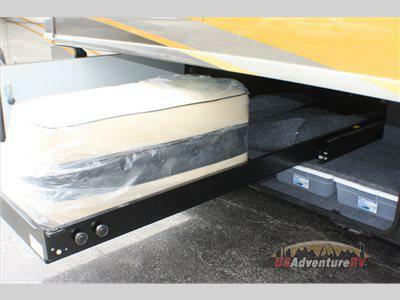 Includes as standard an incredible Tailgate Package for entertaining outside your RV without missing any conveniences, and you can party in style and relax to your heart’s content. You’ll be the envy of every other tailgater. 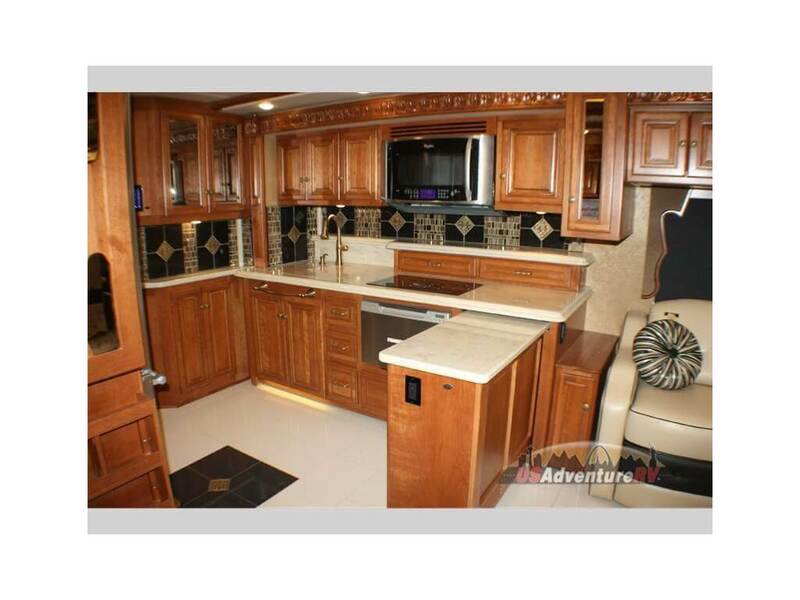 In a nutshell: one and a half baths, quadruple slides, a king size bed, and a 50″ retractable HD TV along with fireplace, full kitchen with tiled walls and backsplash, are just some of the fantastic features of this Grand Tour Class A diesel coach. 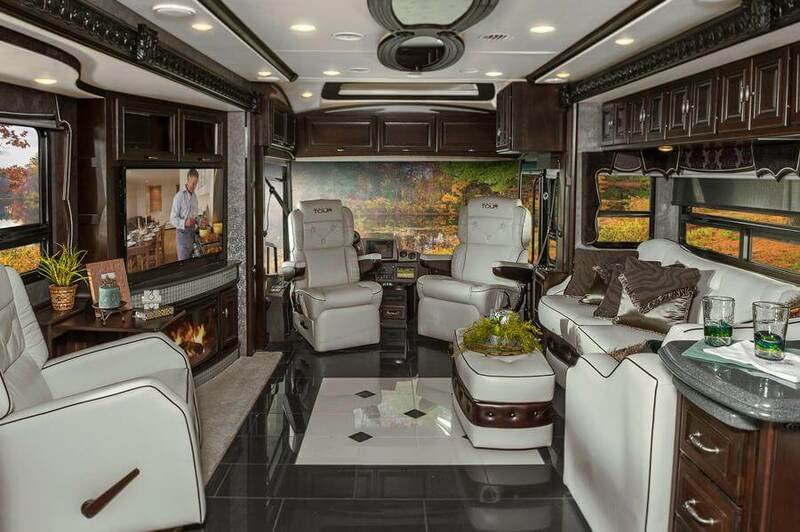 Stepping inside the model 42HL and just in front of the passenger captain chairs that swivel around, you will see a luxurious living space as you look through the coach toward the rear. A slide out features a “Glide and Dine” dining table and chairs along with buffet and corner retractable 50″ HD TV with fireplace. You’ll forget you’re in an RV. In a second slide out you will enjoy a beautiful 60″ x 75″ sofa with overhead storage, ottoman, and end table. Part of the kitchen appliances include a counter top peninsula, a two burner stove top, a double kitchen sink, and an abundance of overhead cabinets. Residential stainless steel French door refrigerator with a freezer drawer, water and ice dispenser, a curio cabinet and corner pantry for dry good storage. There is also a hutch off the kitchen slide along the outer half bath wall. Wow. The half bath is centrally located and features a toilet and vanity with Corian counter space with backsplash plus overhead storage. The master bath features a porcelain toilet, seriously big shower with a flexible showerhead, a slide out linen cabinet, vanity with sink, and washer/dryer. A sliding door separates the main living area from the spacious master suite. A king bed slide has dual nightstands, ample overhead storage, a slide out dresser with wardrobes on either side, and across from the king size bed is a 32″ HD TV. 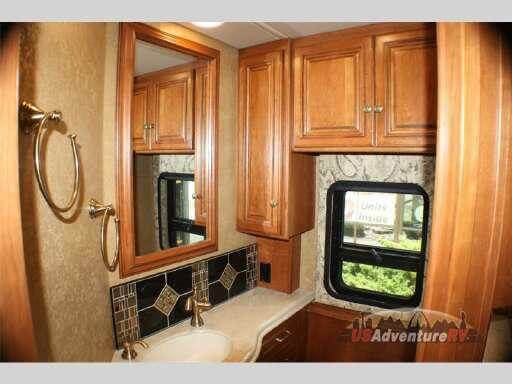 And finally, the exterior of this coach boasts many lighted storage compartments including a huge shelf complete with storage bins with lids. You have plenty of room to store many large and bulky items as well as the many smaller ones you don’t need to keep inside your elegant travel home. 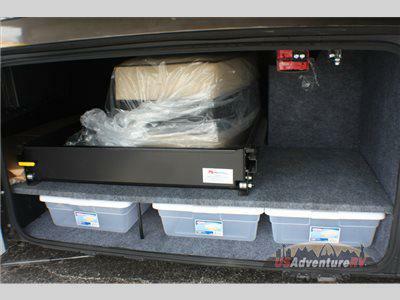 The Tailgate Package, also on the exterior is neatly tucked away and truly unique and well thought out for your outdoor entertainment center. A standard feature it comes complete with a pull out table, a single burner induction range top, steel counter, refrigerator/freezer, bottle opener, garbage holder, LED fixture and much more. Facing toward the cab shows a spacious living area with fine finishes for an elegant home away from home. 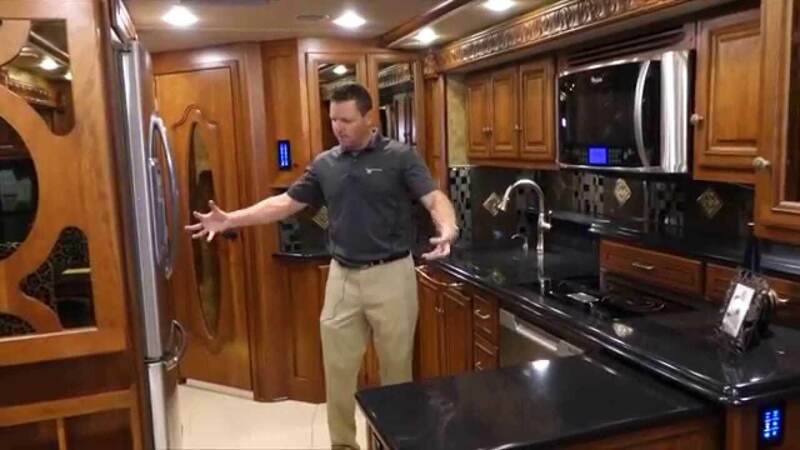 Winnebago showing how truly spacious the Grand Tour is with ample room in the kitchen galley. Another view of the kitchen galley shows residential layout with generous storage, tile floors and beautiful tiled backsplashes. Kitchen with convection/microwave and another of the three wood finish collections and closer view of the tiled wall. King size bed in a spacious master bedroom with yet another fabric and wood finish collection available for the Grand Tour 42HL. Huge master bathroom features an abundance of cabinetry, Corian countertops, porcelain commodes, skylight, tiled backsplash and elegant residential amenities. 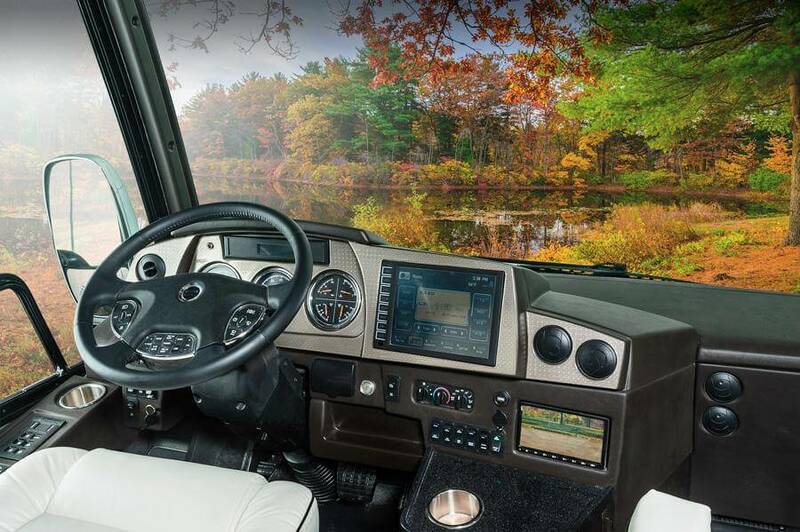 Driver cab controls and comfortable lumbar swivel captains chairs with heat and massage; all with the latest SiriusXM technology satellite radio for entertainment and navigational confidence. 4 slides on this coach expand the already spacious interior. 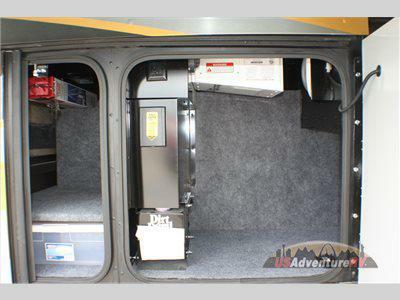 Huge exterior storage compartments with covered boxes and lighted shelves for easy access. More exterior compartment storage bins that are deep and well lit for all of your storage items. Sliding drawer exterior storage shelf.